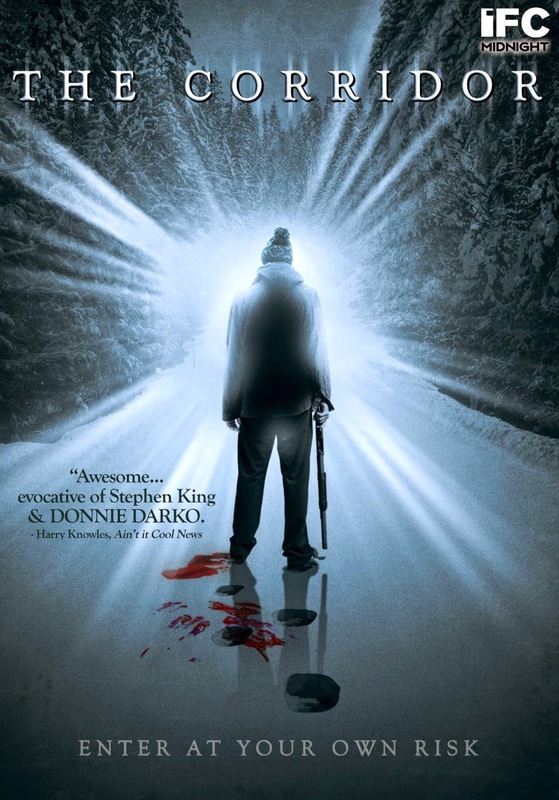 Tag line: "Enter At Your Own Risk "
Director Evan Kelly’s 2010 film The Corridor tells the story of a group of guys trying to repair their damaged friendship, only to have it torn apart by powers beyond their control. As the movie opens, Tyler (Stephen Chambers) has locked himself inside a closet in his house, and is looking down the hall at his mother (Mary-Colin Chisholm), who’s lying, dead, on the floor. Concerned for their friend’s well-being, Chris (David Patrick Flemming), Everett (James Gilbert) and Robert (Matthew Amyotte) force their way into Tyler’s house, only to be attacked by a now-insane Tyler, who, brandishing a knife, slashes Everett’s face and stabs Chris through the hand. Jumping ahead several months, we join Tyler, who’s just been released from a psychiatric hospital, at his family’s cabin getaway, where he intends to spread his mother’s ashes in the surrounding, snow-covered woods. Hoping to make amends, he invites Chris, Everett, and Robert, as well as another old friend, Jim (Glen Matthews), to join him. Though tense at first, the five, who've been buddies since high school, soon break the tension by talking about all the good times they’ve shared. Things take an unexpected turn, however, when Tyler, while walking through the woods, encounters a strange wall of light, which seems to encapsulate him. Fearing he’s once again losing his mind, he leads the others to this spot, only to find they, too, can see it. What’s more, the longer they stay inside the light, the bigger it becomes and the better they feel. But it isn’t long before the friends have fallen under the light's spell, which causes them to turn on one another. Aside from the opening scene in Tyler’s house, the majority of the movie’s thrills don’t kick off until the midway point, when the group first discovers the wall of light. In between, we’re treated to what amounts to an intense drama, during which we get to know the main characters a little better. Robert, aka “Bobcat”, was quarterback of the high school football team, and prefers to live in the past (he brings along the videotapes of his games, a reminder of his glory days), while Jim confesses to Chris that he’s sterile, something he has yet to share with his wife (seeing as she’s desperate to start a family, Jim fears she’ll leave him after learning the truth). Some horror fans may find it difficult to sit through the “getting to know you again” scenes, but it’s moments like these that make the finale so disturbing, forcing us to watch as these characters, who we’ve come to admire, systematically crush the life out of one another (both literally and figuratively). While I can’t say I completely understand The Corridor (the origin of the box of light is never revealed), I did enjoy it. A well-acted film that takes a few dark turns along the way, The Corridor ultimately brings a lot more to the table than your average horror / thriller.